The following social media audit is based on Stripe’s company blog. 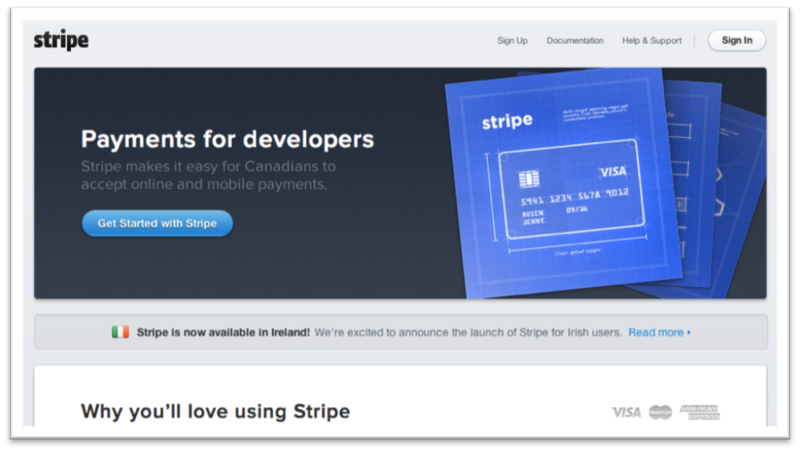 Stripe offers an easy, and developer-friendly, way for companies of any size to accept web and mobile payments. Stripe has taken the time to create a clean blog design that complements their main site. * Individual elements, such as background colour and font style, shouldn’t be neglected as they can affect your visitors’ experience. Stripe achieves seamless branding by customizing their blog to convey the same professional and trustworthy image as their site. Incorporating the standard ‘stripe’ logo that appears on the main site, along with hand written ‘Blog’ text, is a nice touch for the title. Stripe also links each word to either the site or blog home page. Linking to your site from the blog’s header is a great way to drive traffic to your offering, as readers are more likely to convert. Stripe has neglected to add a bio on their blog, which may also serve as a way to increase conversion. A description of their services, or even a short tag line, can further educate visitors on Stripe’s offering and encourage them to visit the site for more information. As a growing business, it is common to spend more time building your product than creating content. Stripe updates their blog once a month, which is a great start, however, additional content can increase customer acquisition. Quality content will help more people discover Stripe, and benefit from the payment solution. 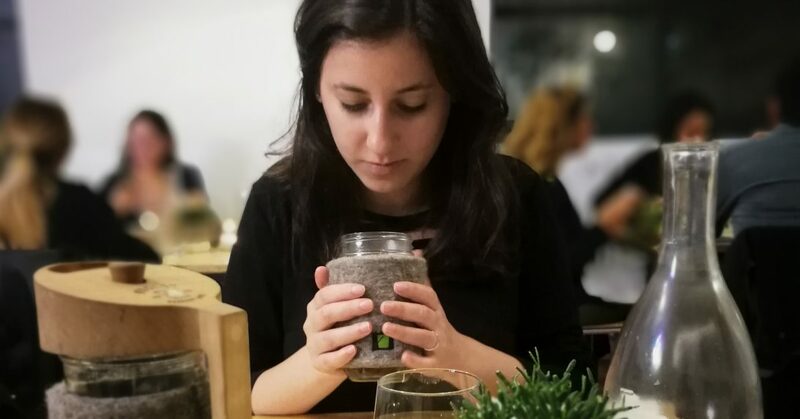 Seeing as Stripe has a variety of employees contributing to the blog, new posts can be created based on their personal interests. Each author can use their knowledge of Stripe’s target market, and shared passions, to better connect with Stripe’s audience. Writing about topical subjects, other than Stripe itself, can also better position Stripe as a leader within their space and lead to memorable discussions. In addition to educating prospects, a blog can be a great way to retain current customers. 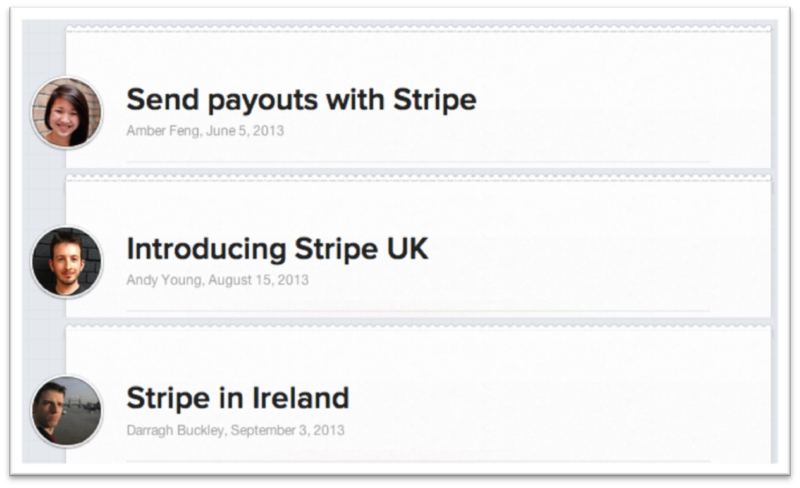 Stripe appeals to customers by sharing company news as well as highly technical tutorials. Customers can learn how to implement new features, and click through to the full documentation for more information. Many of Stripe’s employees contribute to the blog, and the variety helps the team seem more approachable. However, the Stripe blog doesn’t allow for reader comments. The friendly image of each author leads to his or her personal bio, but it would also serve as a great opportunity to link to the team member’s social media profiles to facilitate discussion. While Stripe does invite readers to follow their official company Twitter, the modern RSS, their blog posts don’t include any social sharing buttons. Even if Stripe’s audience may be mostly using browser extensions to share content, social sharing buttons can serve as a reminder as well as allow every reader to easily share engaging posts with their network. Stripe has a beautiful footer with multiple versions of relevant calls to actions. While there are some posts without the footer, most of the posts end by prompting the reader to act. Some visitors may skim posts; others may leave right away, but those taking the time to read the whole post are more likely to click-through. If you plan on using a blogging platform such as WordPress or Tumblr, instead of creating a blog from scratch, it’s important to customize your blog to ensure consistent branding. Stripe’s highly technical team has done a wonderful job on their blog’s design. As Stripe grows, they should consider diversifying their content in order to better engage readers. Including social sharing buttons and a comment section will also help boost engagement, as well as extend the reach of each post. If you’re interested in uncovering your company’s social media strengths and weaknesses, please contact me here. *Stripe’s website has been updated since the writing of this report.